An hour’s bus ride from Ulan Ude lies Ivolginsky Datsan, a Buddhist temple, the most important in Russia. It sits in the large valley, surrounded by grasslands, quiet and peaceful. The complex of buildings is large and colourful, with countless animals both painted on the walls and roaming about. There were even small deer amongst the countless dogs, puppies, cats and birds. We found our own kind of peace in this place meeting with the dogs and a serene looking cat, who drank tea, or staring at the statues of deities and monks, and trying to sneak our way into the main temple without a ticket. Apart from this temple, all of the buildings were open, free to access. 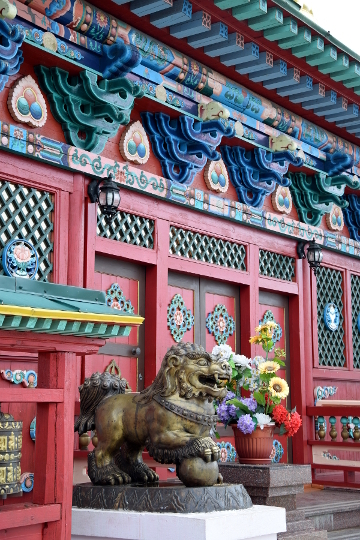 The main temple, however, was guarded by a monk, who only opened the door to certain groups. The temple is under such ‘high security’ for a special reason- in it sits the mummified body of Pandito Hambo Lama. He was exhumed during the Soviet Union, but reburied out of concern about how the Soviets would react to the discovery that he was perfectly mummified. The body made BBC news last year when the monks claimed that although he is dead, his fingernails and hair continue to grow, in a state of prolonged meditation. In the end we snuck in by pretending to be part of a tour group. 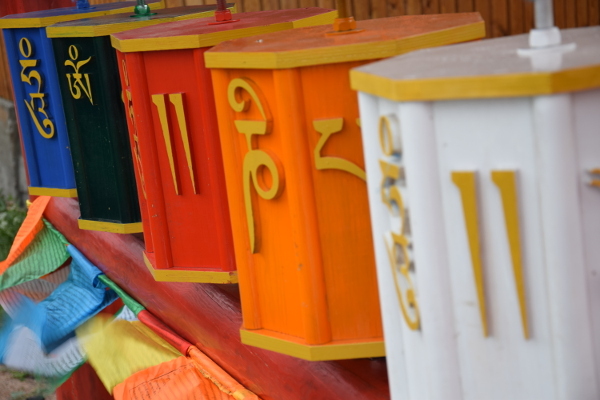 In all of the temples, as well as around all of the prayer wheels, life moves in a clockwise direction. You enter on the left and then walk around carefully, most people never turning their back to the monk or the statue that are on the central shrine. The monk sits behind a pane of glass, in his own miniature temple, as intricately painted and decorated as the outside. Flowers, food and candles lie at his feet, and the worshippers quietly pray. As we went to exit, a second monk stopped us, pushing blue scarves into our hands, smiling, and gesturing. The tour group’s guide explained to us that this was a special offering, that we should keep safe and, upon our return home, place in a clean spot in our house. And that was how we got our souvenir from Russia.